In news that is not new but had slipped through the cracks, the inaugural race at Iowa Speedway next year has been named the “Iowa Corn 250 Presented By Ethanol”. The track is 7/8-mile in length and I haven’t seen if that’s 250 laps, miles or kilometers. If you know, please feel free to Comment. Considering how much work he put into getting Ethanol involved in the league, I’m thinking the powers that be should consider working Paul Dana’s name into the title. 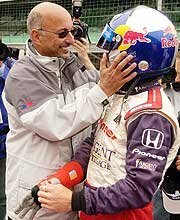 Speaking of Rahal Letterman Racing, So Damn Indy found a story from the Columbus Dispatch (Bobby Rahal is from Ohio) announcing RLR’s intent to not pick up the option on The Rainman’s contract. "All I’ve been told is I can go talk to other people, so we’re talking to people everywhere in several series," Rice said. "It’s a wide-open deal, and there’s also people calling and looking at possibilities, so we’ll see where this goes." The “several series” comment isn’t surprising when you consider there will be more drivers than cars next year. Also, Rahal let everyone know he’s got an open mind for his stable next season. "The big thing is getting the best possible drivers, and we’re in no real rush, as far as I’m concerned," Rahal said. "We may even want to test a few drivers. We’ll see." Quick Wade, grab your helmet and a firesuit! Lastly, IndyStar reports Formula One and Indianapolis Motor Speedway have agreed to a one-year agreement to again host the U.S. Grand Prix. Despite the 2005 Michelin fiasco resulting in a spartan six-car race, the race still drew around 100,000 fans in 2006 – mostly from visitors who happily pumped over $100M into the local economy. The one-year contract is probably just a provision for now, since the ruling FIA agreement (a.k.a. the Concorde Agreement) expires after next season. For the most part both IMS and FIA seem to be happy with the current arrangement, so barring a mass exodus of teams from Formula One expect a longer-term contract next year after a new Concorde is reached. Bottom line – Mo’ money for Tony, Mo’ racing for fans.